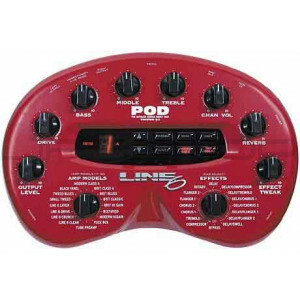 A new standard in direct guitar recording, POD is the ultimate guitar direct recording/performance tool with acclaimed Line 6 modeling and built-in stereo effects. Print this page and you can have your own color brochure! The ultimate guitar Direct Recording tool with acclaimed Line 6 Modeling and built-in Stereo Effects. This baby can also be used as a Tone-shaping front end for any Guitar Amp, Live PA, or with Headphones. Using a POD Mount, the POD can be secured to a standard microphone stand or slip underneath an amplifier handle. Stereo Balanced or Unbalanced 10 TRS outputs, so you can plug it into anything from your home stereo to a really expensive mixing board. ToneTransfer Compatibility. Line 6's ToneTransfer Web Library, is constantly expanding. The sounds you collect transfer seamlessly between POD, POD Pro, and Flextone II series amps, so wherever you go, all your sounds can make the trip. Emagic™ SoundDiver™ software (PC/Mac) for expanded feature access via MIDI. You can get at additional effects parameters, do strange things with the wah functions and lots of other fun stuff..